Gum disease–from mild gingivitis to dangerous periodontitis–affects almost half of adults over 30 in the United States, says the Centers for Disease Control in Atlanta. Past age 65, the number increases to about two-thirds. 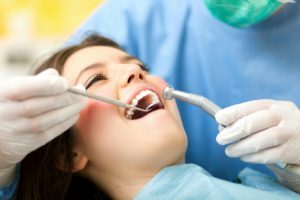 What can you do about gum disease? Prevention is best, but when the condition has already begun, seek skilled gum disease treatment in DC from Dr. Yelena Obholz. Your Washington, DC dentist outlines several symptoms of gum disease. Some patients, however, are not even aware that they have a problem or choose to ignore obvious signs such as blood in the sink when brushing their teeth. Dr. Obholz has done extensive work in periodontics and believes oral health definitely impacts systemic well-being. At Aesthetic & Family Dentistry of Washington, Dr. Obholz diagnoses gum disease by simple observation and measuring periodontal pockets. Pockets deeper than 3 mm are diagnostic for gum disease. Many cases of gingivitis and even periodontitis are treated by simple manual tooth scaling to remove plaque and tartar and root planing to smooth root surfaces so gums re-attach. Others require instillation of antibiotics to quell infection. The most difficult cases require referral to a dentist who specializes in advanced gum disease. Patients who struggle with gum disease (older adults, pregnant women, diabetics or people who are immunosuppressed) should see Dr. Obholz more frequently. The American Academy of Periodontology advises all dental patients get a CPE, or comprehensive periodontal examination, each year. There’s no time like the present to begin better gum health. Contact your Washington, DC dentist at Aesthetic & Family Dentistry of Washington today for an appointment. View our short video segments that offer tips on achieving better oral health.